The design of the USA Pavilion for Expo Milano 2015 focused on innovation and advanced technologies. 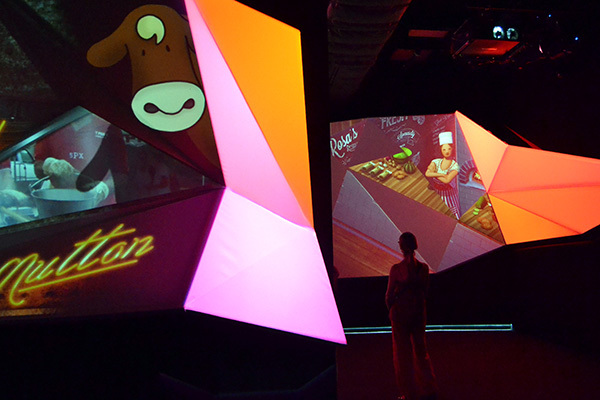 The theme of the pavilion was American Food 2.0: United to Feed the Planet. 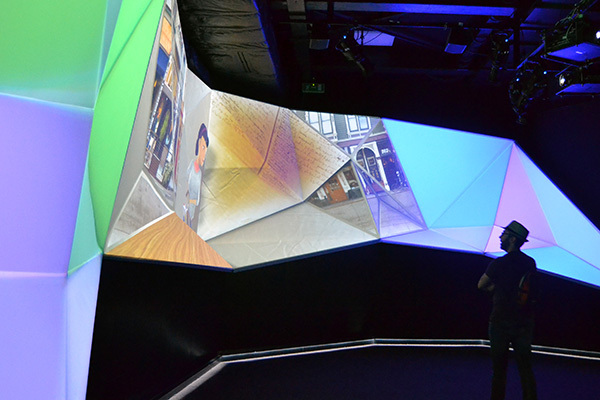 Within the ground floor of the 3-story pavilion were twelve angular displays which undulated throughout the space acting as screens for projection mapped video. The faceted design created a visually dimensional effect when hit with motion projection. Creating a movie theater of sorts, the undulating shapes were created using fabric stretched over frames. 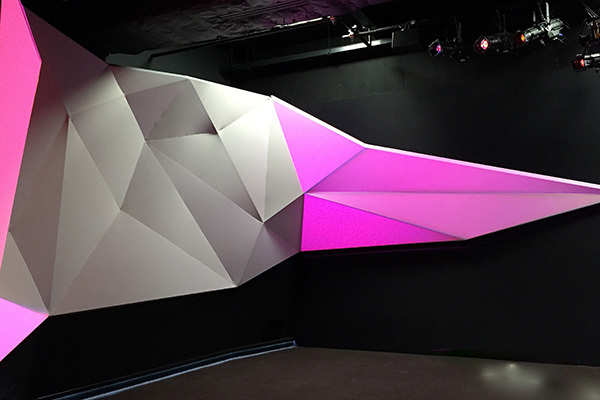 Early on, it was requested that the surfaces achieve high-quality projection, appropriate sound response and balance, quick installation and easy mobility. It was also required that the structures be completely floor supported. Engineered and constructed by Fabric Images Europe, the structures utilized a combination of square and round aluminum tubing. Each structure was engineered over a central point of gravity, due to the angular nature, in order to keep balance when supported from the floor and above the MDF base structures. Ranging in size from 10 feet up to 60 feet in length, and spanning 10 feet in height, the twelve structures varied in the design of facets. So, while complex angles were prevalent in each structure, not one was the same. With both faceted angles and projection mapping coming into play, a fabric had to be used which would enhance these details. 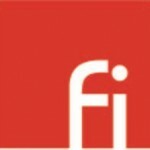 Chosen for its pristine personality and ability to cleanly accept projection was a polyester fabric by Otto Friedrich. Along with the fabric selection, came the finishing application. To hold to the ever-changing inside to outside angles, the fabric was finished with a series of zipper pockets along the back side which tightly held it in place to each inside angle. 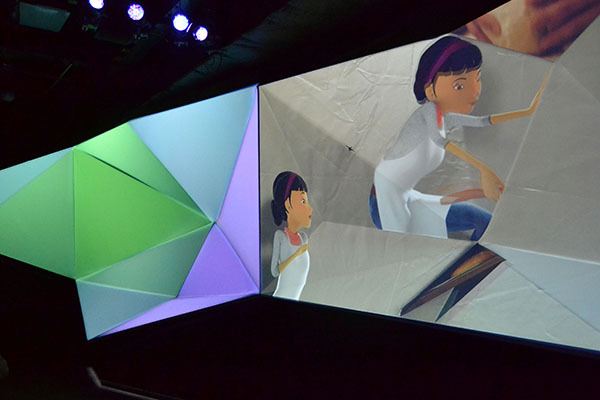 The most critical aspect of the screens was the integration of projection mapping. Along the angular surfaces, the ever-changing imagery would fall in line with each individual facet. The mapping of imagery began with the completion of engineer drawings of the framework. Once the structures were manufactured and then married with the projections at install, only minor tweaks were made to ensure alignment at every angle. 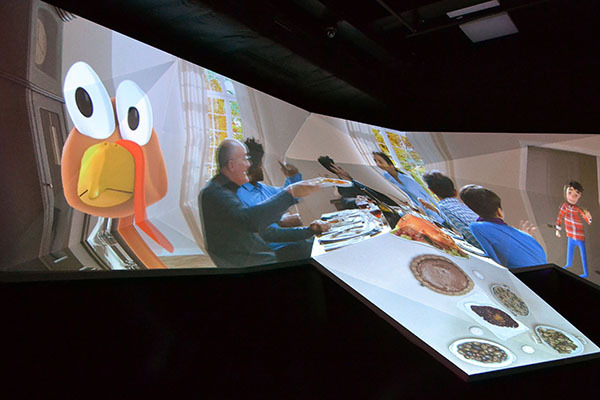 The complex installation successfully carries out the transmission of suggestive short movies dedicated to food, which was the theme of Expo Milano 2015. The results of the projection performances over the faceted surfaces exceeded the customer’s expectations. As high-profile architecture, the quality of the product, engineering and installation timing all played a role in the successful outcome.